Strange things are happening to me. I am the first to admit that I am not fond of pink. I do wear pink on occasion, in fact I have shocking pink tights that I like to wear on particular dreary winter days. 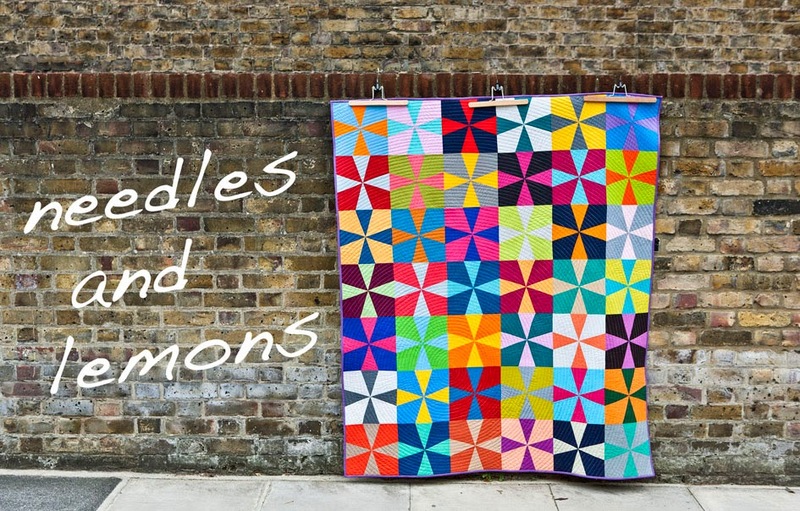 No, the dislike of pink stems mainly from the gender polarization of the colour. When I see toddlers or little girls dressed top to toe in pink I see red (sort of). 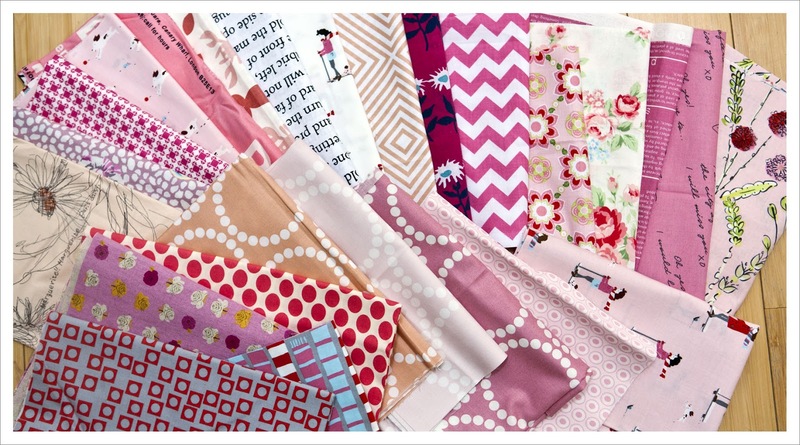 When it comes to quilting I use pink sparingly and if I do then it is the shocking kind of pink more that the soft kind but I have quite a bit of pink in every possible shade as I often buy whole collections and most have a couple of pink pieces in there somewhere. I often extract the pink fabrics and put them in my scrap bin. I have done that quite a bit with the jelly role quilts I made over the past year (see here and here) in an attempt to minimize the usage of pink. Said scrap bin is now somewhat overflowing and over the past weeks I kept eying the pink strips sticking out of it. So one day last week I upended the bin and separated every piece of fabric that had pink in it. 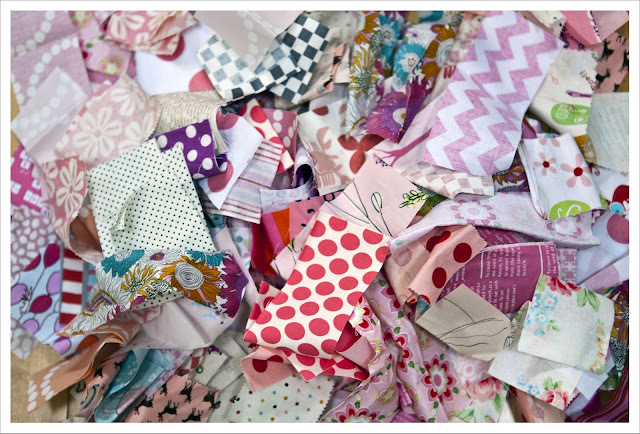 When that was done I realized that there was a lot of pink but also a lot of red sneaked into the pile so I did a second separation exercise and ended with a more harmonious pile of scraps. Then I briefly contemplated to transfer it all to the rubbish bin but quickly thought better of it. So I took the scraps and guided but the 2.5 " wide jelly role strips started cutting everything that was in this pile into 6.5 x 2.5 " pieces. Randomly without thinking or planning. After that there was no stopping me and I dived head first into my stash and pulled almost every single piece of fabric from it that had pink in it together with peach (which is my second least favorite colour) and some text prints and a few contrast prints for good measure. You know for someone who claims not to like pink I sure have a lot in my stash ! And I kept cutting along some more until I had a few pieces of each of the stash fabrics in addition to the the scrap bin pile I already had. And then I started sewing these together into blocks of three strips each measuring 6.5 x 6.5 ". Again I did this mostly randomly without much planning and thinking and it felt gloriously liberating ! Oh, thank you for saying this. I feel the same way about the whole "pink is for girls" thing. It really bothers me when I see comments about fabric lines being perfect "for girls" or "for boys". Especially since pink was once considered a masculine color. I don't mind pink as a color, but I feel really bad for little boys who like the color or other "feminine" things and are made to feel like it's bad or wrong, or for little girls liking something deemed boyish by society (like robots or pirates). I'm probably just sensitive, but I was one of those little girls. Anyway, your blocks look really fun, and I can't wait to see what comes of them! Love the blocksI I know exactly what you mean about the whole 'pinkification' - I have a 3yr old daughter and I like to dress her in a range of clothes, including a lot of her brother's hand me downs. I love pink but there are so many great colours that I don't see the need to limit little girls to only one. And it is taken to extremes - I have refused to set foot in an Early Learning Centre since they brought out a pink globe (using pink for the sea instead of blue)! Good for you to embrace the Pink! I am a "stubborn" type about color also. My niece is a red head and was told "you can't wear pink" -so I got her pink things that she wore and Loved! Ha ha.. I also think most men look great in a pink shirt. I wonder what would happen if we told girls they could never wear blue since it is a "boy color" - absurd huh? But then so is the "pink thing"
I love pink, but the right pink, and at the right time - and this looks lovely - keep going!!!! I like pink but I agree about the whole pink for girls thing. It makes my blood boil when I see ranges of fabric featuring pirates, robots etc being 'perfect for boys'. Yes if the boy likes that kind of thing, and perfect for a girl who likes pirates too! Let's form a club. 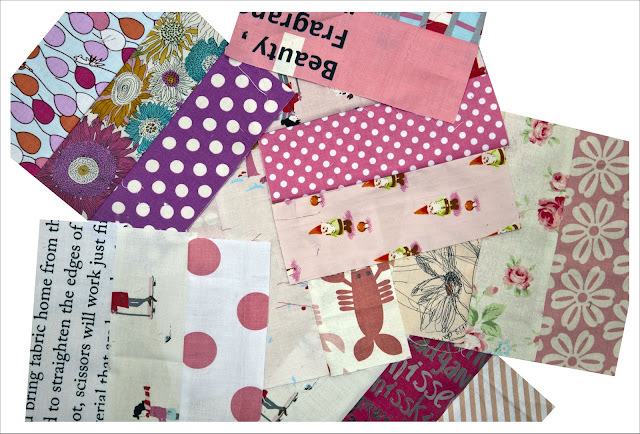 And good luck with the pink quilt, it can be exciting to challenge yourself like that! I don't really like pink, but somehow in quilts it often looks great. 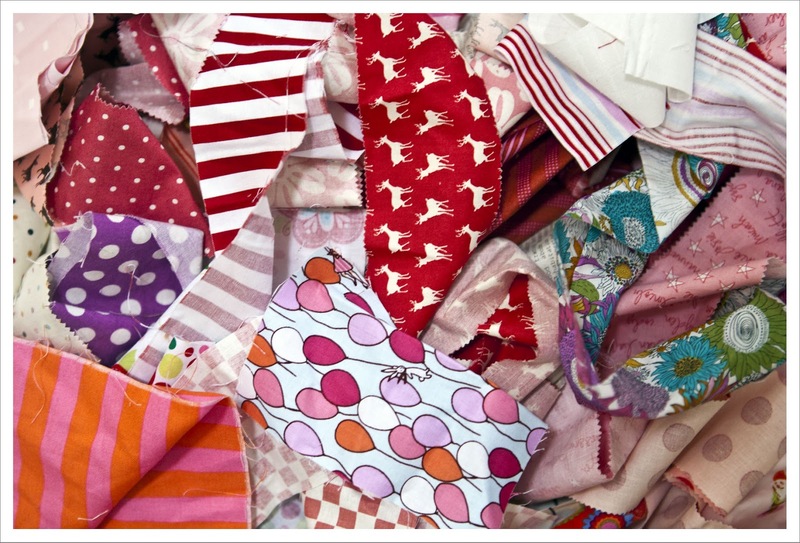 I love what you're doing with the scraps, you have lots of great fabrics there.